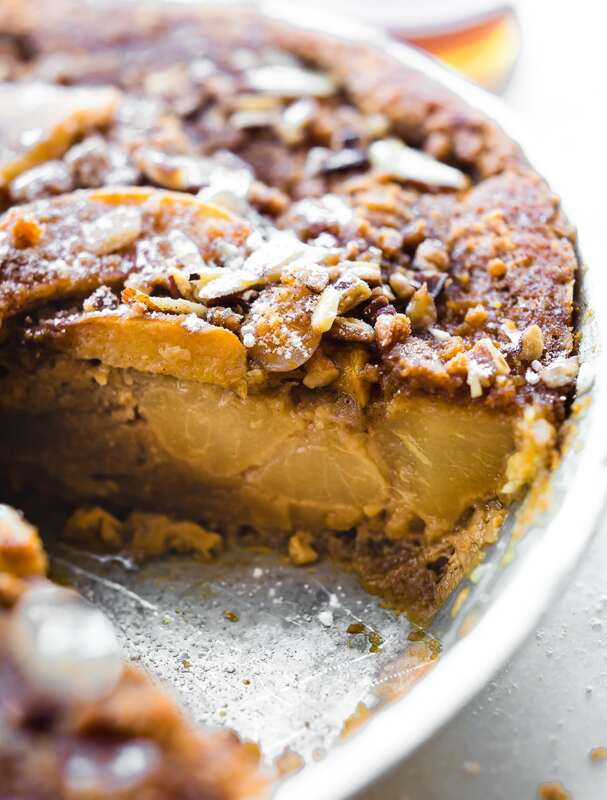 Impossibly EASY Paleo Pear Apple Pie is a spiced Pear and Apple Paleo Pie recipe that’s IMPOSSIBLE to mess up! Made with simple, healthy ingredients; eggs, non dairy milk, maple syrup, pears, apples, nuts, and spices. This easy Apple Pear Pie forms it’s own crust while baking, saving you time in the kitchen. Not to mention a lighter pie recipe! This tends to happen. I go from one extreme to the next with gluten-free and Paleo recipes. Have no clue what I’m talking about? That’s OK. Just refer back to my healing recipe post on Sunday. Keyword being healing recipes that are all food allergy friendly. Nourishing recipes that are ready to get your immune system back and check. Paleo plant based, Anti-inflammatory, AIP friendly, and whole 30 recipes. 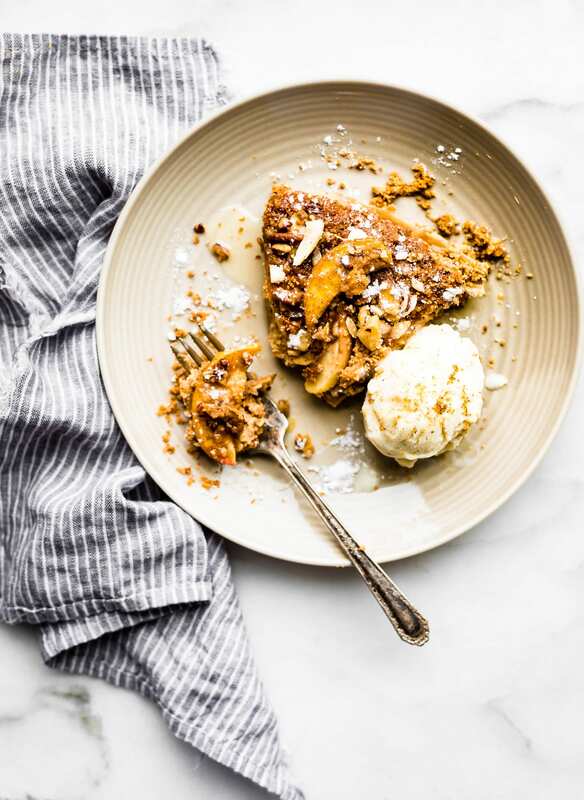 But this paleo pear apple pie recipe is not one of those healing recipes. There’s the extreme for ya. Okay yes it is paleo (for the most part), but I don’t think you would heal your gut from eating paleo pie at every meal. . Unless you need foodie soul healing. Haha! Holiday pie euphoria. Sometimes I cheat when it comes to gluten free or grain free baking and I’m totally OKAY with it. GASP! 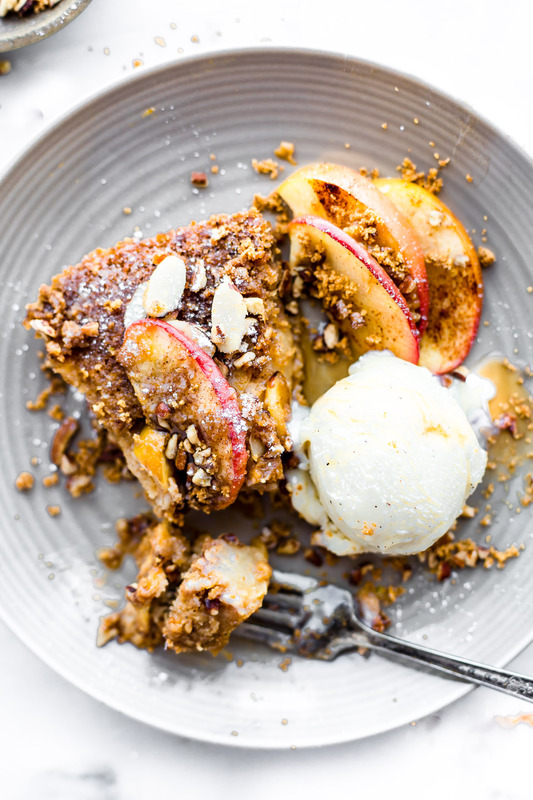 Yes, this is a “cheaters” Paleo Pear Apple Pie. But it is cheating in the most deliciously easy (and healthier) way. Plus IMPOSSIBLY EASY paleo desserts make me happy! Even if they do have just a wee bit more “natural” sugar. You see, last year around this time I made a Paleo sweet potato pie. An impossible pie. If you don’t know what impossible pie is, you’ve been living under a rock. No I’m just kidding. You haven’t. But you need to know about the impossible pie. It’s a pie that makes its own crust so you don’t have to! I have nothing against pie crust, in fact I make my 3 ingredient pie crust quite often, but when it comes to a pie that has a light custardy (yes that’s a word) filling, I’ll stick with the impossible pie. You don’t want that thick pie crust overpower the creamy fruit pie filling. TRUST ME! This “custard like” filling is made with eggs, milk, and a fruit or sweet vegetable of choice. When you bake it in the oven, the eggs make the pie rise and form a sweet caramelized crust. It’s almost like making a soufflé, sweet Soufflé. Quite heavenly If you ask me. 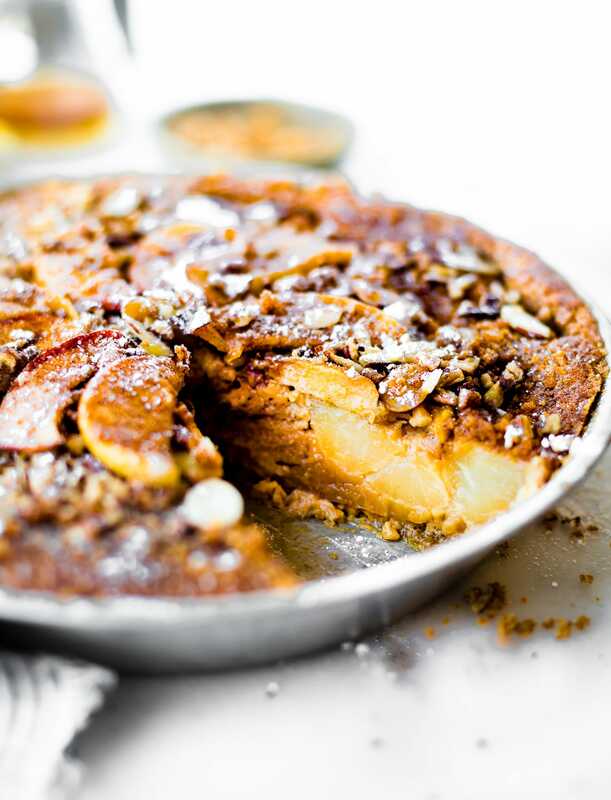 This Pear Apple Pie one of those Paleo pies that you don’t know it’s Paleo. It’s also super easy to make for those who are intimidated making a grain free and gluten free pie. Anyone can make this. Hence the name impossible pie. As in it’s impossible to mess up. In fact, I hauled this pie in cooler last weekend to meet up with my family. Yes we had a little Thanksgiving sampling in the condo, along with the paleo sweet potato casserole. It was wonderful! And they all devoured it! They had no idea that is was even Paleo. Which made me happy. Good food, real food, does not need a label. Wouldn’t you agree? It just needs a little love and flavorful ingredients to shine. 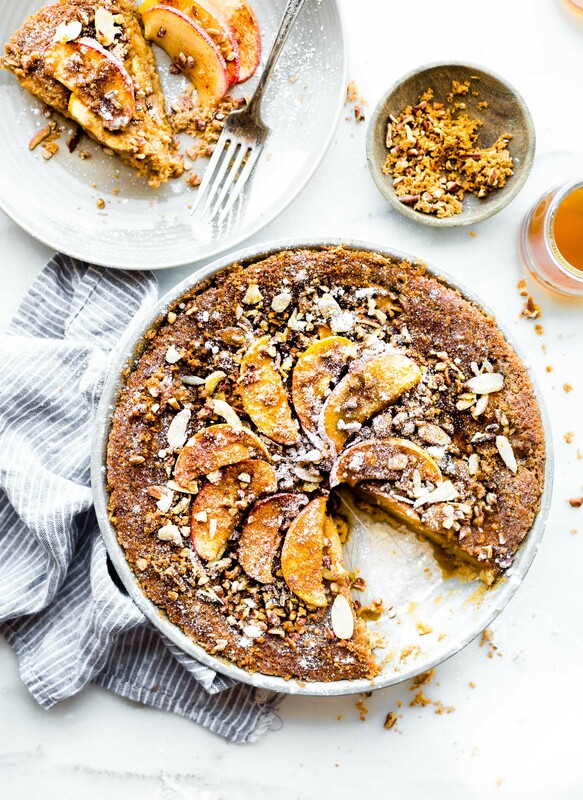 For this Fall inspired pie, we will be using apples and canned pears (in their own juice). Just whisk it together with the eggs, coconut or almond milk, maple syrup, cinnamon other spices, and a little bit of tapioca or arrowroot starch to bind. Mix with your fruit, pour, bake, and voila! Pie is made! Pretty simple ingredients made in a jiffy. So, have I convinced you to make the pie? Let’s bake and eat. Mmm k? Made with simple, healthy ingredients; eggs, non dairy milk, maple syrup, pears, apples, nuts, and spices. This easy Apple Pear Pie forms it’s own crust while baking, saving you time in the kitchen. Paleo, gluten free, grain free, dairy free, vegetarian. Heaping 1/2 cup of arrowroot flour (or tapioca flour) Between 1/2 c to 2/3 cup. Extra apple slices, crushed pecans or slivered almonds, cinnamon, coconut sugar or powdered sugar (not paleo) and cinnamon. Melted butter to drizzle. 1. Preheat oven to 350F. Line a 8 inch or 9 inch pie pan or cake tin with parchment paper. 2. Combine milk, eggs, maple syrup, vanilla, and butter in a blender (see notes). Blend until smooth the Transfer into a bowl. 3. 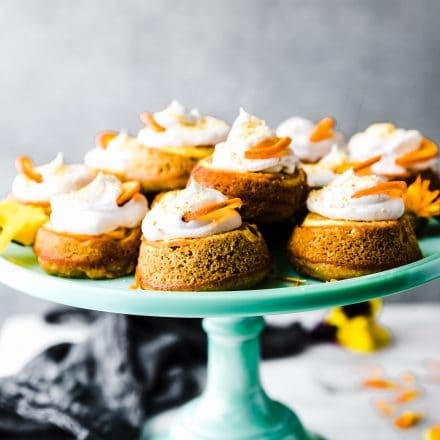 In another small bowl, sift your coconut flour and then combine with your arrowroot starch (or tapioca flour), sugar, cinnamon, ginger, salt, baking powder. Mix together. 5. Fold in about 1/2 cup or more of your coconut flakes. 6. Pour into your prepared pie or cake pan. 7. Sprinkle a handful of slivered almonds, pecans, and thinly sliced apple on top. 8. Bake for 45- 50 minutes. Remove from oven, drizzle a little melted butter (optional) on top, cinnamon, more coconut sugar, etc. Then lightly Cover with foil and bake again for 15 -20 minutes, or until center comes out clean with toothpick. The edges will be crispy brown once brown. 10. Remove from oven. Let it cool for 10 minutes so the center can set. 11. If you are not serving this right away, place pie in the refrigerator to set more. It will still have custard like texture in the middle. *Coconut sugar can be replaced with brown sugar if you are not paleo. If you don’t have a blender, you can beat all the liquid ingredients together using stand mixer or hand held mixer. Make sure the batter is smooth. Once ready to serve again, reheat in oven for 5-10 minutes. Serve with coconut milk ice or whipped cream. This pear apple pie also freezes well if you’d like to keep for longer. Baking notes: This pie was baked at altitude. If you are at sea level, be sure to check on the pie around 45 minutes to see progress. Estimated Nutrition based on using almond milk. Ya, I’m a dork. You’re welcome. What’s your favorite pie? Ever made an impossible pie? 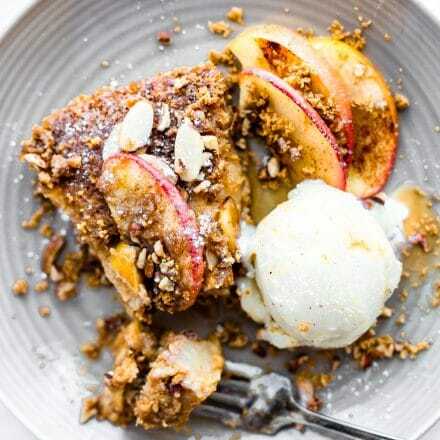 Here’s your chance to cheat and start with pear apple pie. Just sayin…. I can’t belive someone actually knows impossible pie! My favorite is the original impossible pie or the pumpkin pie version. It’s what my family does for Thanksgiving. Thanks for paleoizing it for me, I will be trying this soon. Yes! I love impossible pie too! Last year I made a coconut sweet potato impossible pie, paleo. SO GOOD! Keep me posted. 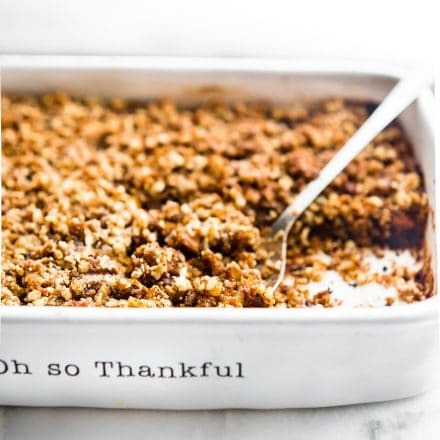 This pie has Thanksgiving dessert written all over it! Can’t wait to give this one a try. Pinned! Hi there, Im a dork to so we have that…..not to mention this pie looks amazing! I love impossible pies, Probably because Im not a crust fan as it is so this works for me. I also love the pear and apple combo. Us dorks have to stick together! Right? LOL! Pear apple perfecto! I saved you a slice. Bring coffee! I’m all about how easy this! Need to try this soon. P.S. I’ve never had a pear though in my life. You’ve never had a pear??! Oh my! YOu gotta! I did an impossible chickpea flour quiche LONG ago when I was eating vegan. I am a huge fan of sweets, so I’m really not sure how I haven’t done a pie. This may have to happen this turkey day! Genius, as always. Super jealous I don’t live close enough to be invited to your Thanksgiving practice round! Lucky family!!! Well, I think we will be calling our meal on thanksgiving “Cotter Crunch’s spread” I will be adding this to the list to test before T-day… Now the problem is… Do I make the Impossible sweet potato pie (Praise Jesus for sweet potatoes), the “PIE” aka casserole or this for dessert ..Or just make all 3 since they’re so easy! Love it Lindsay! This look absolutely mouth-watering! I don’t think I would ever know any of your cooking/baking was paleo. Everything that I’ve tried from your blog tastes amazing; my family raved over the brownies. And I just love that you made it a creamy filling. Pears and apples are some of the best fall fruits. This is paleo?! Say whaaaaat?! Yum! to spice up YO life! 😉 YOSHI. This looks amazing! One question on the coconut milk – do you use canned coconut milk or the refrigerated kind (in a carton)? You can use either, but I personally used almond or coconut drinking milk. It’s a bit lighter in texture. I used coconut milk before (canned) and it is delicious, but doesn’t hold as well, if that makes sense? It takes longer to bake too. oh yay! I so agree! Perfect for the Thanksgiving dessert table Lindsay! My son just started a Paleo diet, so I bet he’ll love it! Thanks for sharing! Oh he did? KEep me posted! Happy to help! Apple pie is one of my favorite kinds of pie! 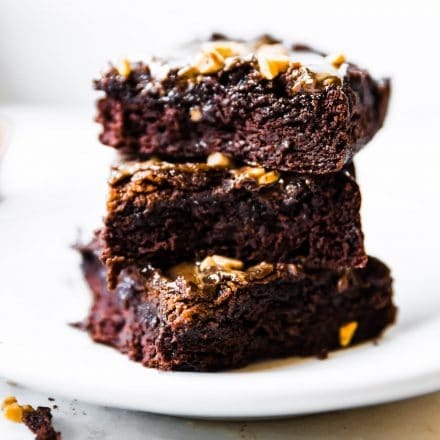 😀 I wonder if there is a way to make this recipe vegan…I would love to try something like this! Good question! I am not sure since it’s a lot of eggs. But I think you could make my maple tea cake like this and use chai and pear. That would divine! This looks so amazing Lindsay! What a great weekend or holiday treat! You are a master at making Paleo look so good!! This is so beautiful and I am totally making this for myself! you so should! I totally hogged this too. Shh… don’t tell anyone. Total yum, loving that crunchy top! So I just so happen to have all the ingredients for this except the flour. Maybe I’ll experiment with using whole wheat. Also, I’ve got regular pairs as opposed to canned so I’ll add a little liquid for the juice. Wish me luck. P.S. You’re my kind of extreme. Blows kiss. I am SO craving this right now!! Yum! I love pears and this looks so amazing. That crust recipe is so inventive! You mention vanilla in step two, but there’s no vanilla listed in the ingredients list. How much vanilla should be used? 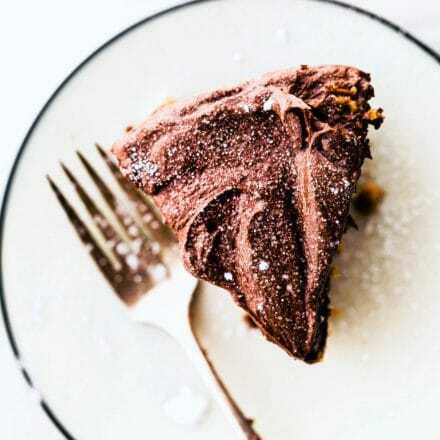 I’m pregnant and DYING to make this pie! YUM! Oh sorry about that. My rule of thumb is 1 tsp usually does the trick! Keep me posted Maria! I usually sift just the coconut flours because they can get clumpy and end up weighing more. It really depends on the brand, ya know? If you find a coconut flour that is nice and light and thin already, no need to sift. Does that make sense? Very interesting information my sister. I love this easy pear apple is awesome and great. Lucky me I found your blog A very useful and informative information provided by you. This was awful. The apples were hard and crunchy and the batter was like soup. Just sent you an email. Happy to help remedy this problem. We’ve never had that happen. so sorry! Sorry, you had this happen! I’ve never had issues like that! I would make sure you’re using the correct flours especially if the batter was soupy! Along with making sure the oil or butter was correct! I know sometimes if I have a recipe fail it’s because I ended up using too much! Hi! I wanted to make this for dessert but the recipe doesn’t say where the coconut sugar goes and how much vanilla? Thanks! Oops, sorry about that. The sugar is sifted with dry batter/flour. I used 1 tsp vanilla.